Do It Yourself, or DIY, creations and projects will give you a more personalised wedding that your loved ones and guests will adore. Putting in the time and effort together on your designs will make you feel more connected and attached when your big day arrives. Having a winter wedding makes the holiday season even more exciting! Another benefit of choosing to Do It Yourself for your wedding decorations, is that you can save some serious cash whilst making sure that the décor is exactly as you want it. Since it is winter themed, We wanted to help you out and give you some fun, creative ideas if you don’t know where to start. Check out our list of winter wedding decoration ideas that will help you achieve that winter wedding you’re dreaming of! The kosher salt in this ornament place card adds a touch of snow in the winter. This fragrant DIY winter wedding decoration idea adds to the festive atmosphere of your big day. 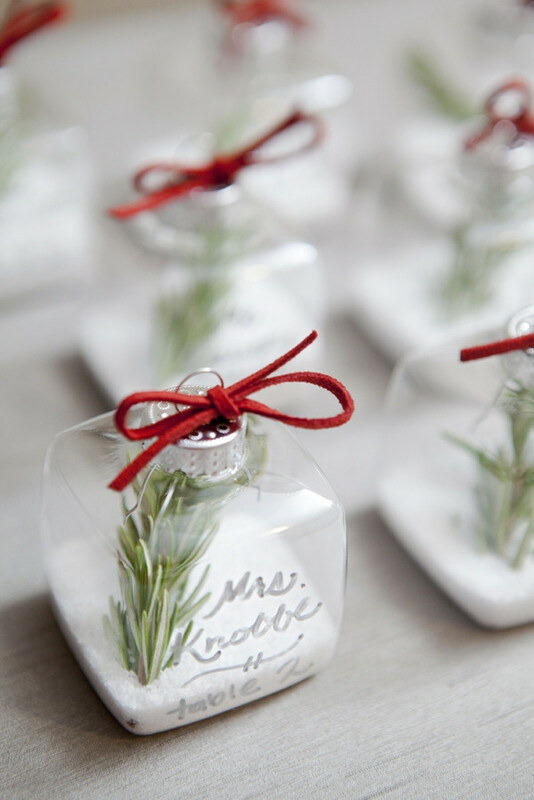 In doing this, you will need: salt, clear plastic ornament, sprigs of fresh rosemary, sharp metallic paint pen, tweezers, and ribbon or twine. Want to make these gorgeous little ornament place cards? Then find out how by clicking here. Everyone loves an instagrammable backdrop. It’s so trendy that some of your guests will be looking forward to what your winter wedding backdrop will be. Well, you can surprise them with this unique DIY wax paper backdrop. With its wonderful and very unique design, you can give your guests an additional winter wedding accent that they too can do at home. In making this DIY wax paper backdrop, you need 10+ yards of ribbon, size 10 crochet string, tapestry needle, scissors, 1 1/2 boxes of inter-folded waxed deli sheets and match sticks. Here's how you make your very own wax paper background. These DIY golden nugget photo holders can work either as your centerpieces or one of the souvenirs for your guests. You can be creative with them, they don’t have to only include pictures. Why not choose excerpts of your vows printed on glossy photo paper? Or even your favorite romantic movie lines. Whatever you choose for this photo holder, it's a great opportunity to add that extra element of personalisation. To make these winter wedding decorations, you need glass rocks, metallic gold spray paint, spiral paper clips, bead landing headpins, and a glue gun. Here'show to make these DIY golden nugget photo holders. This centerpiece winter wedding decoration will make you worry less about finding fresh flowers and it’s a really great alternative. You just need to find a silver vase to complement its design and colour or better yet, spray some silver paint on old vases. This is perfect for an all-white winter themed wedding. It looks very simple, but the accent of ivory gives it a sophisticated look that will last longer compared to a centerpiece with fresh flowers. To make this DIY true paper white, you need: Spiky or round-petaled flower templates in various sizes, card stock, tissue paper in a mix of taupe and ivory, a hole punch and prewired silver Christmas ball ornaments. Find out how to make this true paper white. For more winter wedding advice and ideas check out our article on "Things to consider when planning a winter wedding" and for more styling tips around Christmas check out this little gem!